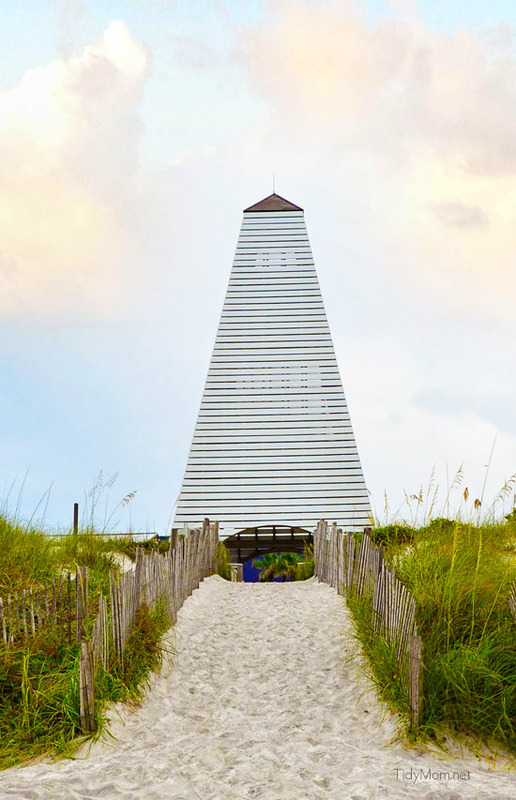 You may remember that I mentioned a few weeks ago that I was taking my daughters to the Cottages of Seaside Florida for a few days. They are 17 and 25 and have never seen an ocean or been to a beach (unless you count a lake beach, but that’s SO not the same). 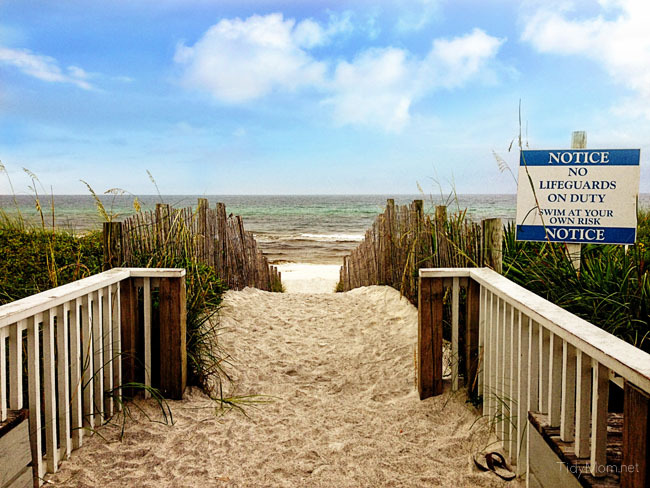 We did lots of research before we decided that the small beach town of Seaside, Florida would be the ideal location for their first beach experience. 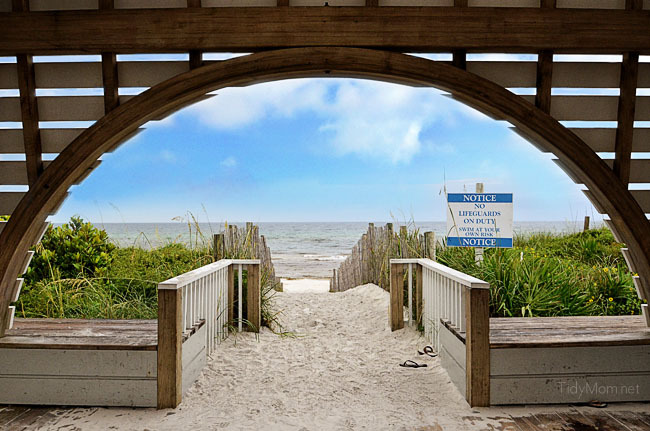 Seaside is a pedestrian-scaled beach town in Florida, located directly on Northwest Florida’s acclaimed sugar-white sand beaches in South Walton County on Scenic Highway 30A, between Destin and Panama City Beach. 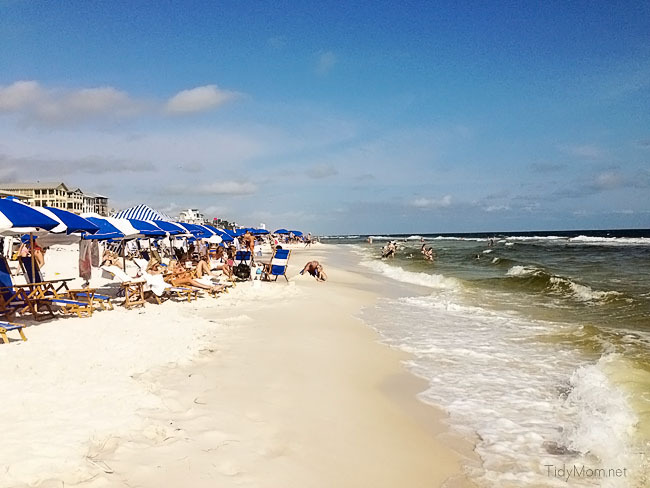 Well, first I read that Seaside, FL was voted as the “BEST BEACH ON EARTH FOR FAMILIES” by Travel & Leisure Magazine! After spending time there, we agree wholeheartedly! It’s one of those places you dream about visiting. Seaside is an 80-acre, unincorporated beach town, where cobblestone streets are lined with charming pastel cottages, white picket fences, and picturesque storefronts. No one is in a rush, you will see families riding to the ice cream shop, bike following bike following bike. The center of town hosts a weekly farmer’s market, outdoor concerts, and movies under the stars. It’s surrounded by renowned restaurants, quiet cafes, gourmet food trucks, clothing and jewelry boutiques, art galleries, home and garden stores, a quaint book and record store, a surf shop, toy store and dozens more. No fast food chains, no Starbucks, no hotels….. just independent entrepreneurs in this small iconic coastal town. Sounds like something out of a movie, doesn’t it? That’s probably why The Truman Show, starring Jim Carrey was filmed in Seaside, 15 years ago this year. Cottage Rental Agency of Seaside was kind enough to host us for our stay and I can’t wait to share our cottage of Seaside Florida with you! 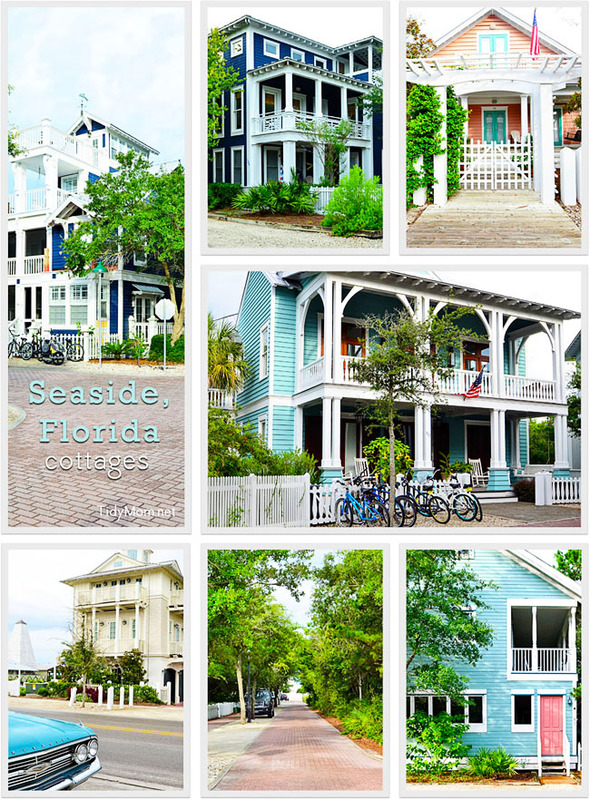 There are about 300 different colors of cottages in Seaside and just as many unique picket fence designs. No two pickets on any one street in Seaside can be of the same design. 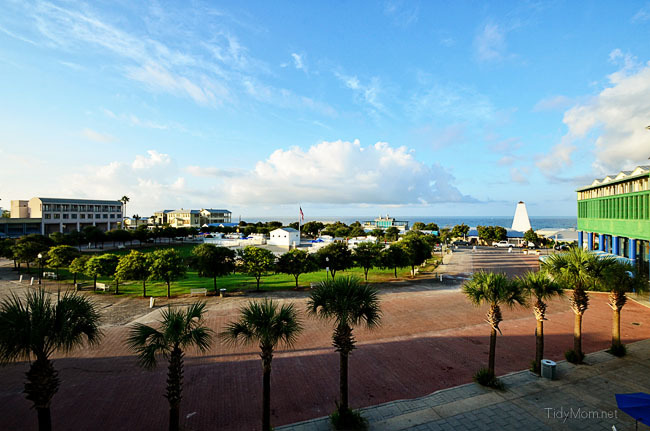 Seaside has won numerous awards for its architecture and town planning and has been the subject of three books and countless articles. 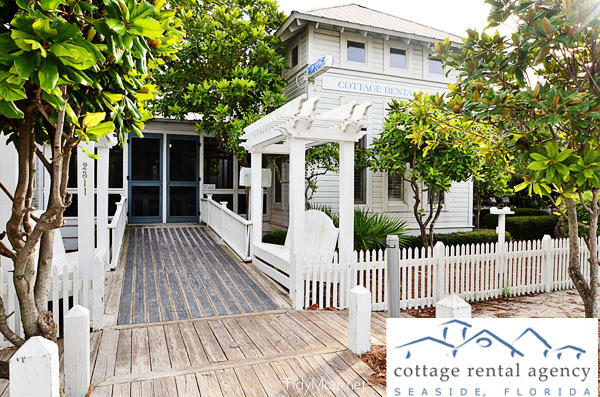 The Cottage Rental Agency is the premier on-site rental provider in Seaside, they offer over 200 vacation rentals in Seaside from private one-bedroom beachfront hideaways to spectacular homes that sleep 14 or more. 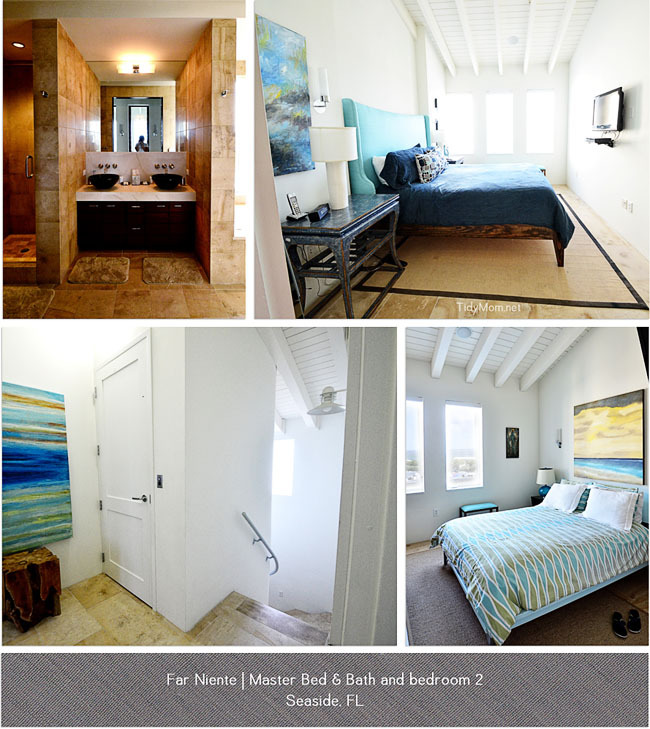 Our beach home for 4 nights and 5 days was a grand two-story penthouse, known as Far Niente, located above Central Square in Seaside, offering panoramic views from every room! It was jaw-dropping gorgeous! 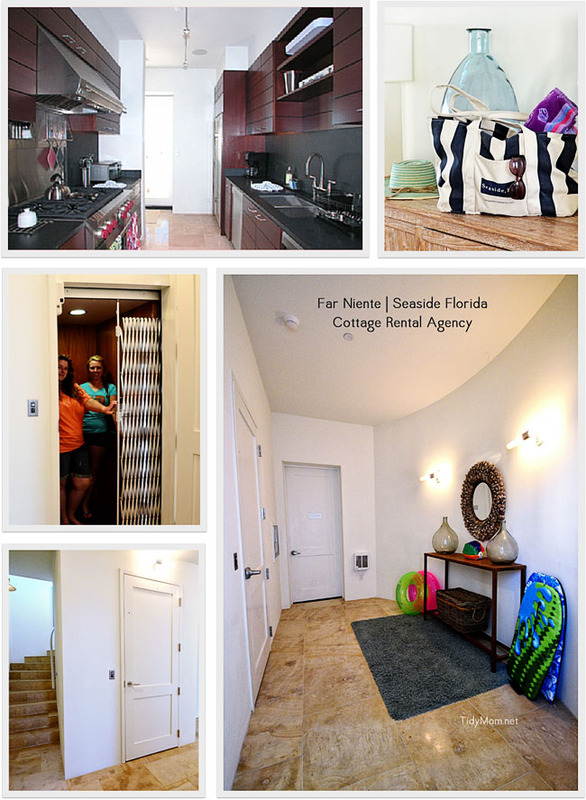 Come take a peek at our Seaside Florida Cottage! We had our own private lobby and elevator to the 2nd-floor main level. The French limestone floors leading to a bright, open and contemporary two-story living room with soaring 25′ ceilings, expansive windows, designer furnishings, a fireplace, 42″ flat-screen HDTV/DVD, and much more, including a modern chef-ready kitchen! The kitchen was fully stocked with everything you could possibly need, although the coffee maker and wine glasses and Wolf refrigerator were the only things we really put to use. We ate out the whole time, but you could come and have everything you need to fix as many meals as you’d like right in the cottage. Modica Market which sells morning mimosas and fresh cut flowers is a gourmet market and deli that is sure to have everything you could need! We all fell in love with the decor! Lots of white, linen, and reclaimed wood! I felt like someone knew exactly what my dream home would look like! 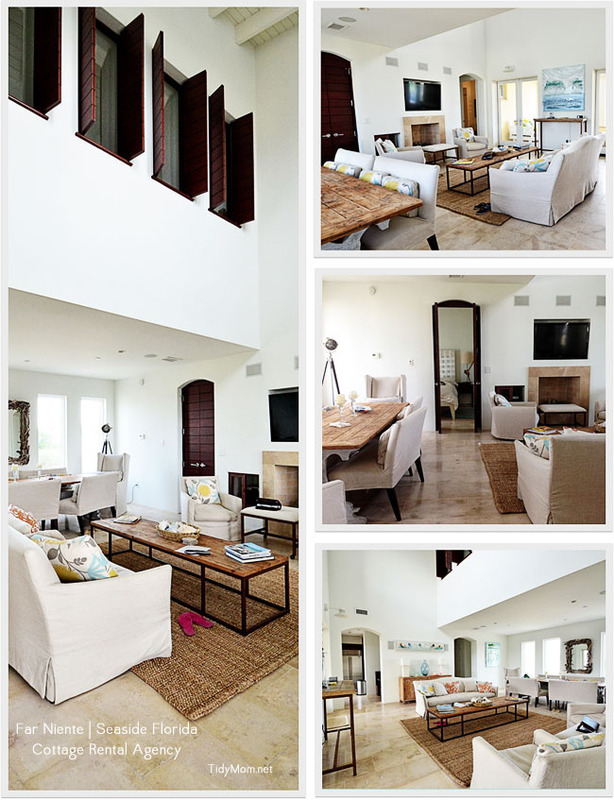 It was magical to call this home for a few days!………I wanted to move in! Allison claimed the queen bedroom on the second/main floor with a flat-screen TV/DVD and shares a bath with the living area. Right off the bathroom was a washer and dryer, which worked out great for having clean fresh beach towels each day. Far Niente had everything we needed to wash all of our sandy clothes before we took them back home! 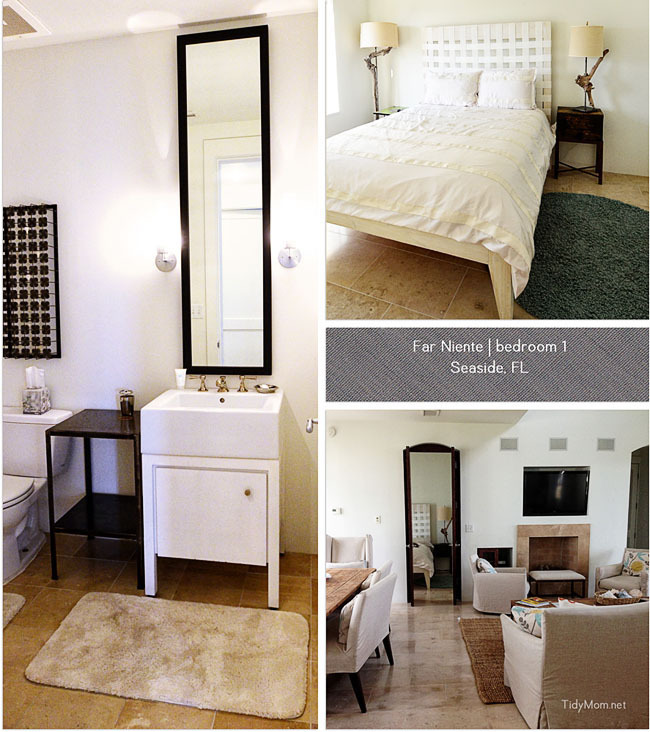 The third floor has another queen bedroom and bath and the master suite features a king bed, vaulted ceilings and a 32″ flat-screen TV with a master bath with two sinks, a shower, and large soaking tub. As gorgeous as the rounded stairways were, we loved the small private elevator, especially for getting our suitcases up to each floor. 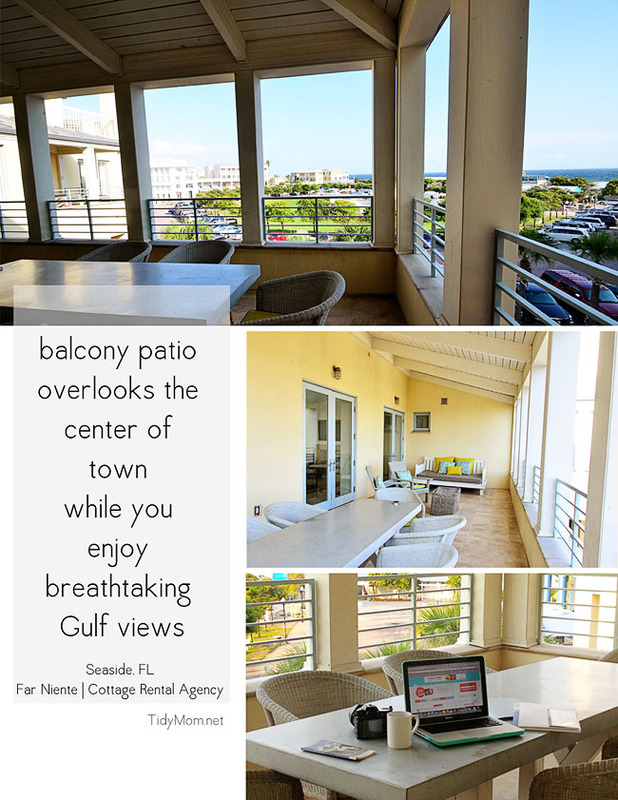 The gorgeous patio balcony overlooking the center of town and the Gulf is where I “tried” to get a little work done, but as you can imagine the view was a little distracting, and the ocean and food trucks were calling my name. Look at the view we had!! Just note, I snapped this early on Monday morning before everyone else was up……see how peaceful and quiet it is in the VERY CENTER of everything! You can also tell what a quick little walk we had to the beach. We had such a BEAUTIFUL and wonderful time in Seaside!! Check back next week to see some of the fun we had in and around Seaside! If you’re looking for a relaxing vacation spot on the beach, I can not recommend Seaside, FL and Cottage Rental Agency enough to you. I now know why Seaside was voted as #1 Best Beach on Earth for families. We are hoping to go back again and bring Steve along next time! To follow along or see more pictures of Seaside, check out their Facebook page! …………I think I see a beach chair calling my name! Disclaimer: Cottage Rental Agency hosted us by graciously providing a complimentary Stay at Far Niente but all views, opinions and my love for Seaside are all my own. How could you ever leave? Oh my gosh, I could live there! I want to go there!! That looks so fun and the sand is gorgeous. Seaside just looks beautiful! I love all of the different colored cottages and that beach is amazing! I’m sure you had tons of fun with your girls! Thanks so much for hosting – have a wonderful weekend. Oh my gosh I need a vacation now! That looks amazing!! Thanks for hosting this week and for all the gorgeous photos! It looks like the inside was as beautiful as the view! Thanks for hosting the party! The whole thing just sounded magical Cheryl! I hope we get to go as a family to Seaside someday. Now I know just where to stay. 🙂 Thanks! I’ve been to the beach millions of times, and now I live at (well about 25 minutes away from) the beach. I’ve yet to stay in a cottage. I will stay in one one of these days, though. You’re pictures have totally convinced me that I absolutely have to! That sounds like the perfect getaway, all the pictures make me want to go now! Oh I am sure these pics are killing Steve. LOL! What a fun place. I’ve heard so much about it before. We go to Fort Myers every year to see Dave’s parents. We also visit Sanibel while we are there. Wow! Your cottage looks amazing! So happy you got a chance to take your girls to the beach and had some fun family time. I hope to go there someday. My husband and I both grew up in south Georgia just a short drive from the Destin-Panama City area. We’ve spent more weekends than we can count on those beaches and they never, ever grow old. So glad that you and your girls enjoyed it! Wow, what’s not to love?!? Seaside looks like a dream! I don’t think any other beach will ever live up to this one for your girls:) What a great first beach experience for them! Thanks for hosting! Looks like you had a great time…what a beautiful place! Thanks so much for hosting and for talking about your trip to Seaside! I’ve been there a few times while living and working in Panama City Beach one summer. My favorite part was watching Truman Show on that lawn in the middle. It was so neat to look around and see where each scene was filmed. (Plus it’s one of my favorite movies…) Hope you get to go back soon! Thanks for sharing your lovely vacation. Your daughter’s must have had such a wonderful time with their Mama. The smell of the ocean is something one has to experience and it sounds and looks like you experienced it at an ideal place. 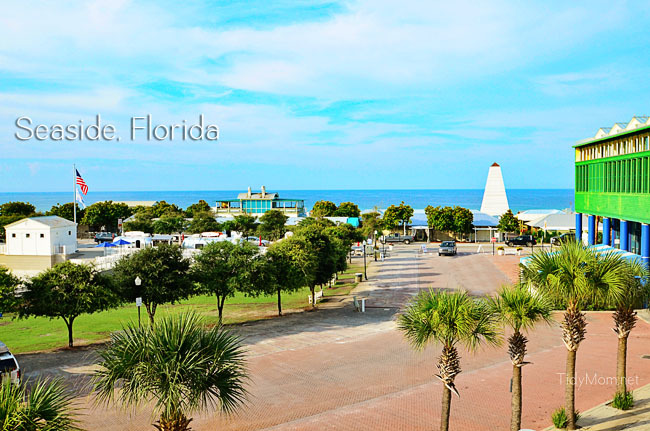 I have never been to Florida, but I do know Seaside looks like a place I would love to visit. I have lived my whole life by the ocean in Southern California, but these beach pictures look straight out of a Nicholas Sparks novel. I want to be there! Simply gorgeous! I loved watching your vacation take place over instagram and so enjoy seeing even more of your vacation here. The history of Seaside sounds so great – I’m going to have to add it to our travel bucket list for sure! Love your pictures! Right?! Her pics make you want to book it TODAY! Cheryl! It looked so amazing! I loved following along with you on your trip! So fun!! We grew up just about an hour away, so we know the area well. It’s an amazing place, the whole emerald coast is. Seaside is a very small little tourist town, and it’ s so different in style and architecture to anything else in the Panhandle. It’s like a little utopia (or at least Truman’s utopia), I love it. I’m so glad that you had a great time! The Gulf has the most beautiful beaches – especially for the first trip to the beach for the girls! The sand is a beautiful white and the water is so clear and blue! 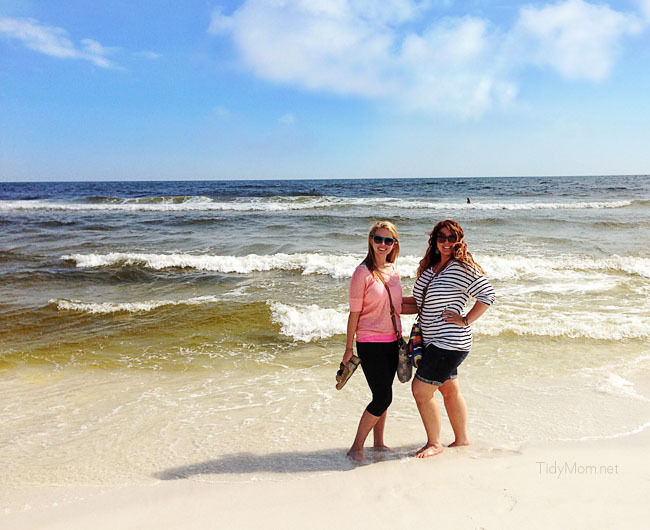 Seaside is GORGEOUS and we love to visit that area when we take beach trips! We too just returned from a vacation in Florida Cheryl staying in a quiet little town below Daytona Beach. Having access to the extensive beaches and the perfect temperatures was so relaxing! We had a dock behind our house where manatees came several times a day too. Your beautiful photo chronicle of your trip will definitely be sunshine to your soul in the middle of winter when you look back on it! Hope the girls loved their first ocean trip! I’d love to take a relaxing vacation to this place – wow! Great description and pics, as always. 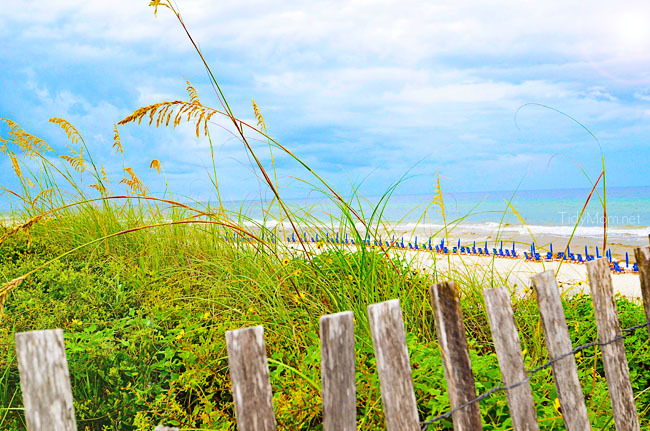 We love Florida and vacation near Clearwater Beach, but have yet to try Seaside. It looks like a great little spot to visit. Will have to check it out. We usually rent a place so I can cook and do laundry. 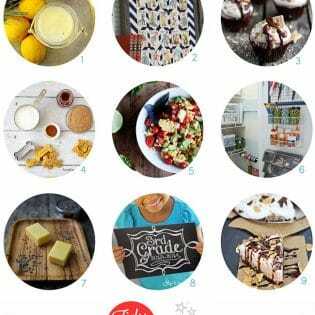 It’s so much more economical and it gives us the flexibility to dine out if we want to (when I want a break from the kitchen ;)). Those pictures are beautiful. What a perfect little town. I may have to start doing a little research on them for a trip down to Florida! Seaside reminds me of Cambria. Love the pics. Gotta book a trip! What an awesome vacation, I would never want to leave 🙂 Thanks so much for the party. Have a wonderful weekend. What a dreamy place to vacation! Wow wow wow! I’ve been dreaming of visiting seaside for a long time. It looks so quaint and beautiful. Looks like y’all had a wonderful time! Looks like a fabulous place to vacation. Wishing my kids were little again – we didn’t do enough beach vacations over the years! Omg, Cheryl, I’m totally jealous! 😉 What a fabulous trip it must’ve been. The penthouse is absolutely gorgeous! And the town sounds so charming… So happy for you! Thanks for hosting the party, and hope you’re having a great weekend! Wow, looks like an absolute dream! I’m adding Seaside to my “dream vacations” list now! Simply, WOW!!! WHat a stunning little town, and I am still shocked to read your daughters had never seen a beach!!! Growing up in Texas, we’ve got the gulf, but florida is a short drive, too! SO fun that you got to do the beach so wonderfully for their first trip! Cheryl, love the picture of your girls at the beach. If you look real close, behind your girls, it looks like a shark fin. It’s probably a surfer, but it looks really awsome. Nice place. Wow, it really looks amazing and I can see why the Truman Show was shot there. I will have to remember this place! how in the world did i miss this beautiful post? makes me beachsick. your pictures are incredible, cheryl! i love the room you all stayed in. it was so much fun to watch you & your daughters experience everything! LOVE seaside! Wow, Seaside FL looks like a lot of fun. 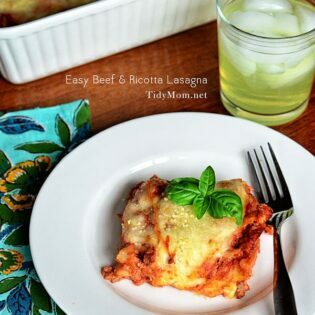 Thanks for sharing such an awesome post!